Rest complex ” Aglonas Alpi (N 56* 06* 417*;E 27* 01* 572*- for car navigation ) „ is located nearly at the same distance from Daugavpils, Rēzekne, Krāslava, Preiļi, and 243 km from the capital city Rīga – on the peninsula Leitānu, 2,53 km from Aglona Basilica, on the bank of Ciriša reservoir and Raudiņu lake. We are waiting for holiday-makers from April till November at any time of day. Everybody, who feels the desire to tear oneself away from daily routine, is welcomed in our peace port, enjoying our offered service: for children, families, foreigners, active sport fans, mental relaxation lovers, travellers with tents , trailers, anglers etc. We offer for overnight 12 comfortable houses. Every house has : shower, WC, kitchen corner (electrical tea pot, cups) bed-clothes, towels, soaps. Dishes for cooking can be rented. The maximum amount of persons in a house is 6. We welcome clients with special needs, and also holiday-makers with their home pets (cats, dogs). We provide and organize sport games and different camps till 1000 persons. Children can use for spending their free time : adventure route, trampoline, swings, sandpit, net, cable for rides and search for the candy tree. 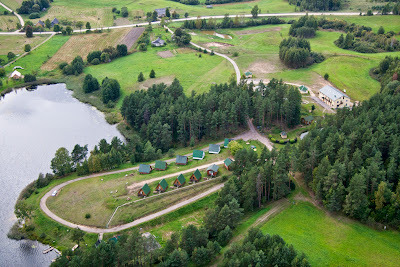 We offer rooms for: seminars, banquets and celebrations (the whole year) till 120 persons( both in nature, and inside). (P63) and drive till Preiļi. Drive through the town and turn to Aglona (road P62). In Aglona you must drive past Aglona Basilica on the road Aglona- Šķeltova, continue the way 2 km following the signs to the camping. Drive with bus Rīga - Aglona/Preiļi- Aglona. Contact with the owners to agree about the time and place of meeting. THE POSSIBILLITY OF ORGANIZING ACTION: sports holidays, various celebrations convention guest house - weddings, anniversaries, seminars, conferences (have the necessary equipment). FOREIGN VISITORS service in English, German and Russian. With the eyes of a tourist Aglona!